I know there are already a million cinnamon roll recipes available on the internet and you might be wondering why I would choose to publish this particular one from someone named Edith. Who is Edith? I really have no idea who Edith is. I imagine her to be someone’s great aunt or grandmother who would make you a home cooked meal when you came to visit. And you would want to visit often because her kitchen would be cozy and inviting and she would bake these soft and fluffy cinnamon rolls with browned butter icing for you on request. Perhaps, I aspire to be Edith in my older years. In reality, my sister clipped this recipe from our local newspaper over 20 years ago and I consider this her recipe even though the recipe was originally published as “Edith Theissen’s Cinnamon Rolls”. Recently, our immediate and extended family voted this recipe the “best” among 9 cinnamon roll recipes we tasted at our annual Thanksgiving taste-off. For the past 8 years, we have hosted my husband’s family for Thanksgiving weekend and we include a taste testing as part of our holiday tradition. Our tastings have included pumpkin pie, chocolate chip cookies, cheesecakes, and vanilla ice-cream. Every year we talk about not doing a taste-off but my kids and their cousins insist we keep the tradition going. So we decided to move beyond desserts to give us some more options. Since we all love cinnamon rolls and several of us have favorite recipes we have tried over the years, we settled on cinnamon rolls for this year’s tasting. We tried 7 “from scratch” recipes plus 2 store-bought varieties (one was from the freezer section and designed to be baked at home, the other was the one from the tube that you pop open). Of the 7 homemade versions, 2 used baking powder/baking soda as the leavener and the remaining 5 used yeast. Everyone loved the fluffy texture and the just sweet enough filling of these cinnamon rolls. I especially loved the browned butter icing. Of course, any icing is good but cooking the butter to the nutty-toasty stage before adding in the powdered sugar is even better. I don’t do a lot of baking and I especially don’t do a lot of baking with yeast doughs. Despite my lack of experience, these cinnamon rolls turned out beautifully. The dough is lovely to work with after the first rising – soft yet easy to roll out. One key factor is to use only as much flour as necessary. You want to use enough to keep the dough from being too sticky but not so much that the dough becomes stiff. I ended up having about 3/4 cups flour leftover. So, even though the recipe calls for 7 cups of flour, you may not need all of it. The dough should be slightly tacky when you’re done kneading it. Also, when proofing the yeast, be sure the water is warm enough to activate the yeast but not so hot it kills it. I use an instant-read thermometer to check the water temperature and go by the recommended temperature printed in the instructions for the yeast. I’m ready to call this recipe our go-to cinnamon roll recipe from here on out. However, my husband isn’t. His favorite recipe ended up being poorly rated and he feels something must have gone wrong in the baking processing. He wants a re-bake. I’ll let you know how that goes. First, scald the milk by pouring it into a medium saucepan and heating the milk over medium-high heat until it begins to boil. Remove from heat and then add the butter, sugar, and salt; stir until butter is completely melted and sugar is dissolved. Set aside. In a small bowl, stir together the yeast, 1 teaspoon sugar, and lukewarm water until the yeast is dissolved. Set aside. In the bowl of a stand mixer fitted with the paddle attachment, pour in the milk mixture and 2½ cups flour. Beat well. Add the eggs one at a time, beating well after each addition. Add the yeast mixture and 3½ cups of flour. Mix on medium-low speed until the dough starts to come together. Then, remove the paddle attachment (scraping the dough off as necessary) and fit the stand mixer with the dough hook attachment. Knead the dough on medium-low speed until the dough is fairly smooth but still soft, 6 to 7 minutes. The dough should be soft and will be slightly sticky. If the dough is too sticky, knead in more flour (a 1/4 cup at a time) as needed. You may not need all 7 cups of flour. Place the dough in a large buttered bowl and shape it into a rough ball. Cover the bowl with plastic wrap and place it in a warm area to let rise until doubled (1 to 1 1/2 hours). Punch down the dough and let rest a few minutes. In a small bowl, stir together the brown sugar and cinnamon until evenly mixed. Set aside. Divide the dough into two equal pieces. Working with one piece at a time, roll the dough into a rectangle approximately 12 by 17 inches. Spread half the softened butter on the dough and sprinkle with half the brown sugar mixture. Roll up the long end of the dough and pinch the seams. Cut into 12 (1¼ inch thick) slices. Arrange the rolls on a 9×13 buttered baking pan. Repeat with the other half of the dough. Loosely cover the pans with plastic wrap and let rise in a warm area until nearly doubled in size and puffy. Remove plastic wrap and bake rolls for 15 to 20 minutes or until golden brown. Let cool briefly in pans. While the rolls are baking, make the icing. Brown the butter in a heavy skillet until it is toasty brown colored and smells nutty. Pour the butter into a small mixing bowl. Add powdered sugar, water, and vanilla; mix well. Allow icing to cool slightly before spreading over warm rolls. For overnight cinnamon rolls: After shaping the rolls and placing them in baking pans, cover the rolls and place them in the refrigerator. The next morning, remove the rolls from the refrigerator and place in a warm area to rise until doubled in size. Proceed with baking the rolls as directed in the recipe. Before adding the yeast to the dough, make sure the mixture is slightly foamy which indicates that your yeast is active. If not, re-make the yeast mixture ensuring that your yeast isn’t expired and the water is the correct temperature. So I don’t have to keep track of how much flour I’ve used and to ensure I don’t use too much, I measure the 7 cups of flour into a separate bowl and scoop it out from the bowl. Make the sure butter is very soft and spreadable before spreading it on the rolled out dough. My sister (from whom I got this recipe) likes to make a double recipe of the icing and spreads the icing on her cinnamon rolls extra thick. Recipe adapted from The Tulsa World via my sister. 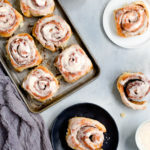 If you don’t have time to wait for a yeast dough to rise but still want delicious cinnamon rolls, try this recipe for quick cinnamon rolls that can be made in about an hour (and they were highly rated in the taste-off).